Exhibition schedule: de Young Museum, Fine Arts Museums of San Francisco, July 16–October 9, 2016. As the word “great” in the title suggests, Ruscha’s relationship to the American West is tinged by both irony and nostalgia, attitudes that have only grown in complexity with the passage of time. Likewise, “American West” is a phrase with many contested meanings, beginning with its imprecise location. As Waldie points out, Ruscha “migrated from the more-or-less real West to the outskirts of the places where Hollywood’s West was made” (28). The story of Ruscha’s migration is told several times in the catalogue and takes on the character of a foundation myth, weaving together many of the themes that have informed the artist’s work. After graduating high school in 1956, Ruscha and a childhood friend left Oklahoma City for Los Angeles, driving about fourteen hundred miles across the storied western highway, Route 66, a journey that the artist would come to repeat several times a year. He was greeted in Los Angeles by a fiery sky, as the sun sank into the Pacific Ocean. This is where Ruscha’s story starts, in an inversion of the Hollywood trope where the hero rides off into the sunset at the conclusion of a film. However, the artist’s sense of awe at this celestial spectacle was cut with an acute awareness of its source: air pollution. He recalls, “I wondered for a moment if I had made a mistake coming out West like this” (12). The tension between seductive image and actual fact is emblematic of Ruscha’s ambivalent attitude toward the American West. The book opens with a biographical essay, “Fertile Ground: Ed Ruscha’s Great American West,” by curator Karin Breuer. Early in the text she describes Ruscha as a mid-twentieth-century pioneer, a useful perspective from which to view the artist’s transformation of themes from both US history and popular culture. For example, Breuer finds a “clever reference” to Manifest Destiny in Ruscha’s painting America’s Future (1979), which pictures a dramatic sunset worthy of a movie poster for a John Ford Western. The painting’s extreme horizontality—it is 22 inches high by more than 13 feet wide—evokes the perspective of a driver of a car, highlighting the fact that this mid-twentieth-century pioneer arrived to the West in a Ford automobile rather than on a horse. The experience of viewing the western landscape while driving played a central role in Ruscha’s early work. Breuer writes, “It was that information from the road, rather than from the landscape, that truly interested Ruscha on his journeys through the wide-open spaces” (13). Whereas nineteenth-century American painters such as Albert Bierstadt celebrated dramatic features of the natural landscape, it was the vernacular landscape of road signs, billboards, and gasoline stations seen through a car windshield that Ruscha found inspiring. Breuer examines how Ruscha used the gasoline station as an “iconic symbol of the new, brash culture that was emerging out of the western United States,” a culture that brushed aside “any romantic or quaint associations of the new American West with the cowboy movies and movies of the old West” (14). She argues that Ruscha made this attitude explicit in the painting Standard Station with Ten-Cent Western Being Torn in Half (1964), in which he contrasts a torn copy of the magazine Popular Western with the crisp, clean lines of a gasoline station’s modern architecture. One of the pleasures of Ed Ruscha and the Great American West is the scope of the catalogue, as it encompasses the artist’s early production as well as his more recent work. By examining the American West in Ruscha’s practice up to the present, Breuer reveals the extent to which the artist’s romance with the open road and the gasoline station is historically specific, a product of the mid-twentieth century. Indeed, Ruscha seems to find little beauty in the superhighways that crisscross the desert today. His 1992 series, Blue Collar, pictures buildings of the “generic type seen in countless industrial parks and warehouse districts,” a contrast to his slick celebration of the Standard gasoline station (20). Set against an ominous sky, each structure is emblazoned with a word or phrase that could be the name of a business, but could also be interpreted ironically, such as “Tires” or “Tool & Die.” Ruscha updated these images in the series Course of Empire (2003–5), named in homage to the nineteenth-century suite of paintings by Thomas Cole. Now set against a pastel-hued sky, The Old Tool & Die Building (2004) is covered in graffiti, with the name of the new occupant written in illegible, pseudo-Asian script. Breuer claims that Ruscha was interested in portraying “change over time,” but also identifies “a certain sad resignation” in these works (21). J. Waldie’s poetic essay, “Ruscha, L.A., and a Sense of Place in the West: ‘It Can Go Any Way It Wants, and I’ll Still Be Here,’” focuses readers’ attention on the city Ruscha has made his home for over sixty years. Waldie, a keen observer of Los Angeles, works through the paradox of establishing a sense of place in a city often accused of engendering a sense of placelessness. He suggests that we view Ruscha’s Los Angeles work as a memoir, a perspective that gives the artist’s notoriously deadpan gaze a more personal cast. It rings true for works that show the passage of time, such as the photo book Then & Now (2005), in which Ruscha revisits the same gritty blocks of Hollywood Boulevard that he originally photographed in 1973. Instead of a narrative of decline, Ruscha seems more accepting of change in L.A. As Waldie writes, “Ruscha’s layered city hasn’t grown worse, only less lurid, more marked by use, and cool by being in the backwash of glamour” (26). The best read in the catalogue is Kerry Brougher’s interview with Ruscha, which centers on the artist and Hollywood. In Ruscha’s case, “Hollywood” refers to the movies as well as a neighborhood in Los Angeles, which was the location of one of the artist’s first studios, on Western Avenue. The conversation ranges across the relationship between Ruscha’s early photo books and film; his paintings of the Hollywood sign, visible from his Western Avenue studio; and two films the artist made during the 1970s. Brougher highlights a series of airbrushed silhouette paintings created during the late 1980s and early 1990s as an example of “film and painting com[ing] together in a new way” (38). The paintings are black and white, employ a “wide-screen composition” inspired by film, and contain subjects familiar from the artist’s early work, which lend them a sense of nostalgia. They also include painted scratches and blips, referring to the materiality of film and, in the now-digital age, a bygone era. The catalogue of objects is organized thematically, with nine short, complementary essays by Breuer. This arrangement allows Breuer to survey early themes, such as the gas station, to which Ruscha has returned throughout his career. It also affords the reader the pleasure of seeing the wide scope of media Ruscha employs in his work. Breuer’s excellent close readings of Ruscha’s art could have been improved by greater attention to historical context, both cultural and artistic. For example, despite much discussion of highways, there is no mention of the Federal-Aid Highway Act of 1956, which established the Interstate Highway System that came to replace earlier roads, such as Route 66. The exhibition catalogue as a whole would also benefit from a discussion of the American West in the work of Ruscha’s contemporaries. As it stands, the narrow focus on Ruscha somewhat undermines the analysis of his work. A selective chronology completes the volume. It is illustrated with photographs that picture the artist in the actual sites that have shaped his work, such as the Mojave Desert and Hollywood. Several of these photographs show Ruscha in Western garb, such as embroidered shirts, a Kentucky Colonel bow tie, and a variety of cowboy hats. These images document yet another aspect of the artist’s relationship with the American West, a performative one, with Ruscha dressing the part. 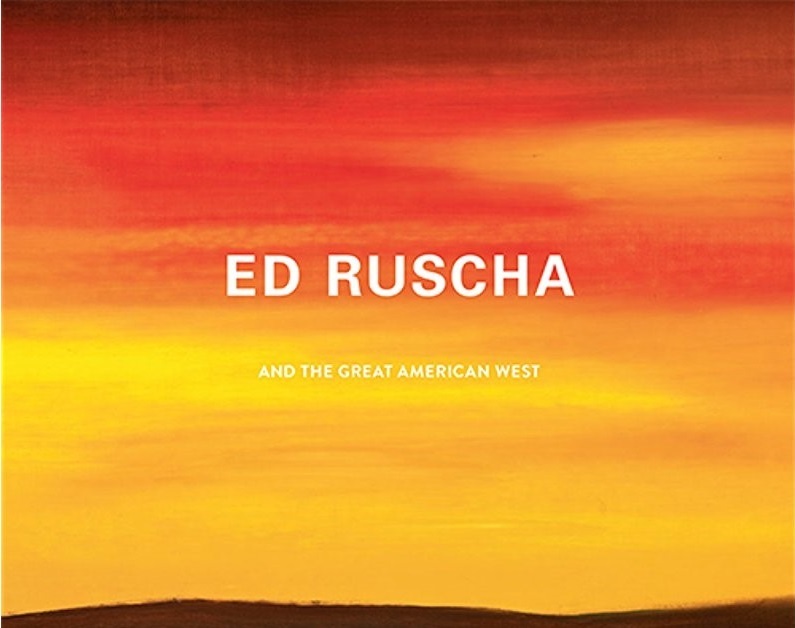 Ed Ruscha and the Great American West is a useful addition to the literature on American art, as it extends themes, such as Manifest Destiny and the pioneer spirit, that shaped the work of earlier American artists, including Thomas Cole and Albert Bierstadt, into a consideration of postwar art. Breuer amply demonstrates the importance of the American West to Ruscha and the complex character of the artist’s relationship with this difficult concept. Cite this article: Amanda A. Douberley, review of Ed Ruscha and the Great American West, edited by Karin Breuer, Panorama: Journal of the Association of Historians of American Art 4, no. 1 (Spring 2018), https://doi.org/10.24926/24716839.1646. About the Author(s): Amanda A. Douberley is Assistant Curator/Academic Liaison at the William Benton Museum of Art, University of Connecticut.